**** Chosen by Winner: Anthony G.
NOTE: Firearm will not be shipped directly to winner, but rather to Federal Firearms Licensee ("FFL") specified by winner (or selected by Knife Rights in Knife Rights' sole discretion). Winner can only take possession of firearm from the FFL(s). Winner must comply with all applicable legal requirements prior to taking possession of firearm. Winner is responsible for $25 shipping charge and any fees charged by receiving FFL. Click for complete rules. The Biggest Bond Ever! Our intimidating TEXAN packs a big punch! 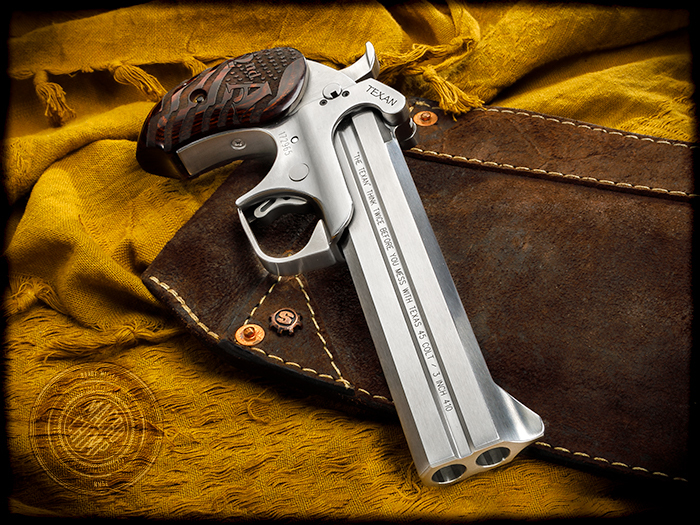 Featuring a 6″ .410/.45 Colt barrel, the Bond Arms Texan is sure to impress! This special Texan features extended Rosewood grips celebrating the Second Amendment over the U.S. Flag. The 6″ double-barrel is chambered to handle up to 3” .410 shot shells and .45 Colt. BOND ARMS, INC. is located in Granbury, Texas and manufactures the award-winning Bond Arms derringer – the finest in double barrel protection. Originally organized under the name Texas Armory, the company became incorporated as Bond Arms in 1995 with the idea that the Remington Model 95 over-under, single-action derringer could be converted from an Old West anachronism into a modern defensive handgun. The barrel and frame were redesigned to safely fire modern calibers. The beefed-up double barrels and frames are constructed completely from stainless steel, and shaped with modern manufacturing processes. This makes for a pistol that’s both strong and durable. This 17-time SASS (Single Action Shooting Society) world champion derringer has become the premier derringer of choice. With such praise from competition and conceal carry users a like, it’s no wonder the Bond Arms Derringer has the reputation as a serious piece of firearm hardware. Single Action Shooting SocietyBureau of Alcohol, Tobacco and FirearmsBond Arms is the leader in the derringer industry in new product development. They have developed an exciting stocking dealer program (SDP). In the online store you’ll find a line of customized products as well as a line of accessory products such as holsters, extended grips, and additional caliber offerings. It is our firm commitment to designing and manufacturing superior “derringer style” guns that has given us the outstanding reputation with the industry and our valued customers . We’re also one of a few manufacturers that still builds exclusively in the U.S. and uses American-made parts for all our handguns. Even our grips and holsters are made in the U.S.A.